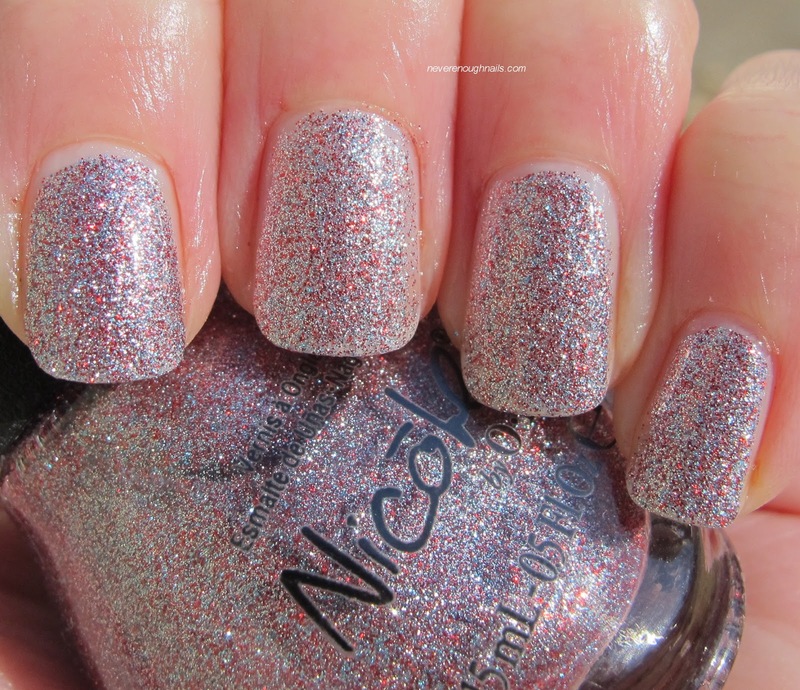 Never Enough Nails: Nicole by OPI Kardashian Kolor Holiday 2012, The Glitters! 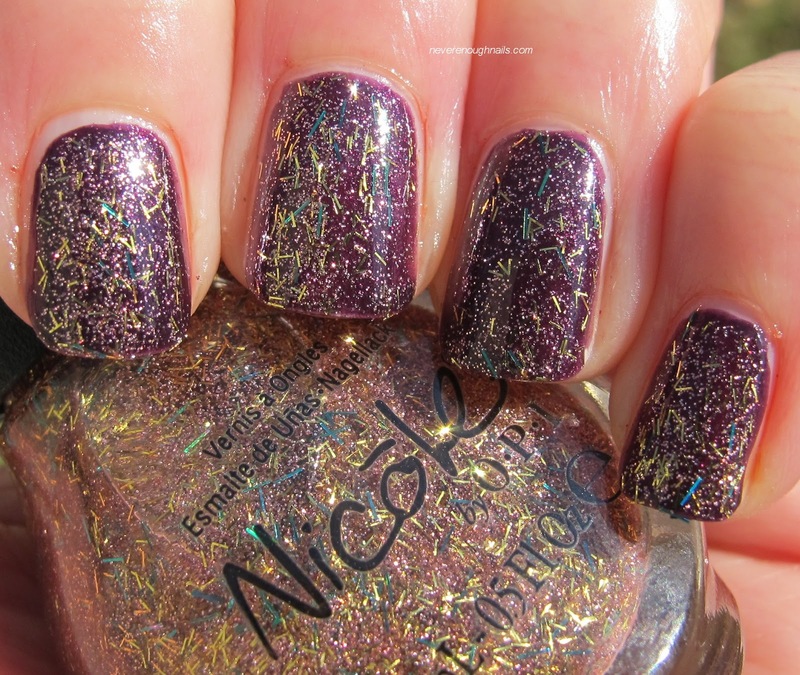 Nicole by OPI Kardashian Kolor Holiday 2012, The Glitters! *passes out from love of this polish* OK, so remember in my first post about the Nicole by OPI Kardashian Kolor Holiday collection when I said I don't always keep the polishes I am sent for review? But I had decided to keep the first three polishes from this collection? Yea, well Nicole by OPI All Is Glam, All Is Bright stepped this up a notch, because not only am I keeping it, BUT I'M GOING TO BUY A BACK-UP OF IT!!! 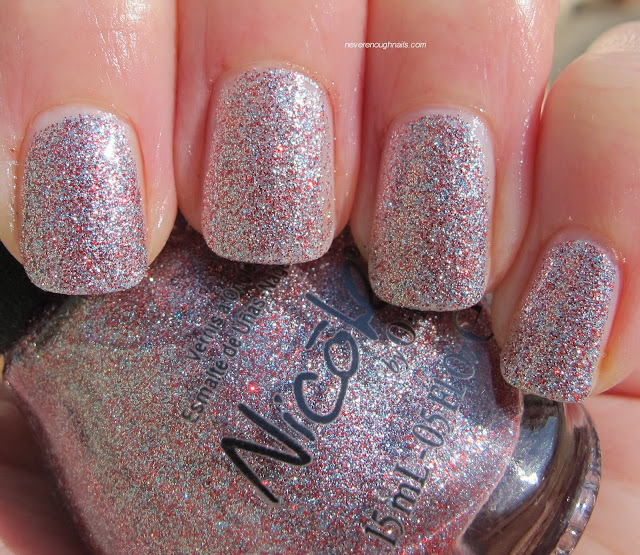 This clear base LOADED with super fine sugary silver and red glitter is now my number one favorite Nicole by OPI polish EVER and one of my favorite holiday 2012 polishes as well! 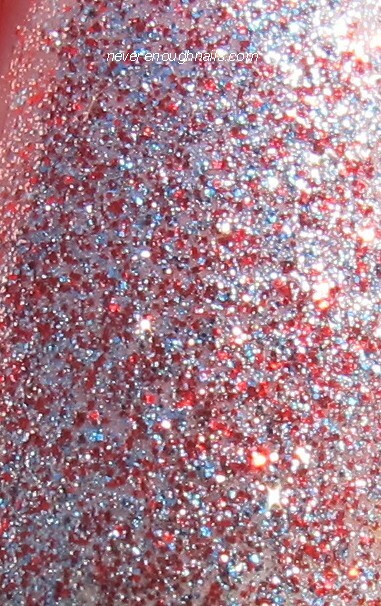 Now, if you weren't dying from the sparklies, let me tell you that this is only two coats and it is 100% opaque. In fact, if you were lazy/doing your mani while running out the door to a Christmas party (me all holiday season), you could do ONE COAT of this polish!!!! One thick coat was opaque with no VNL!! This was also the easiest glitter polish to apply! I'm not sure if you can tell, but I LOVE THIS and highly recommend it to you. 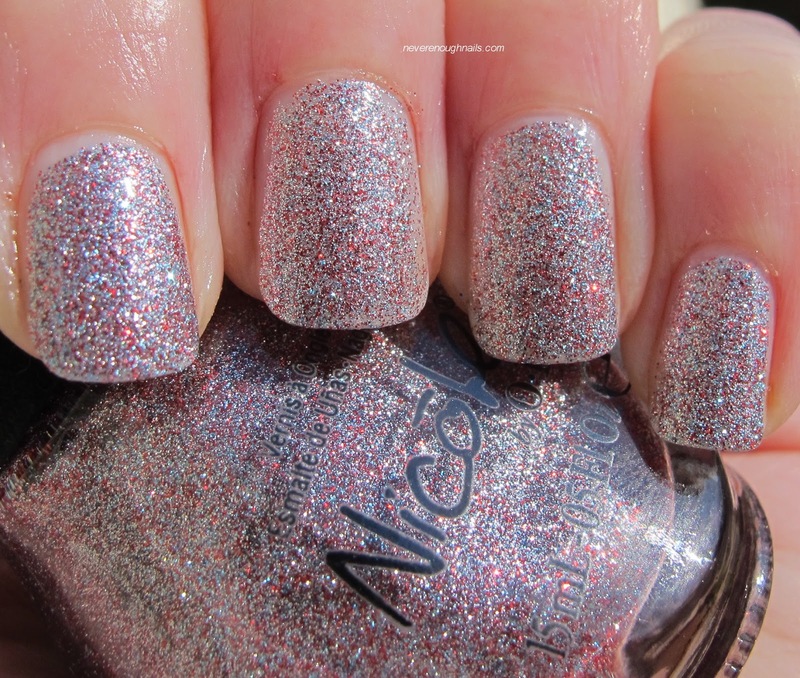 Nicole by OPI Kardashing Through The Snow is a lovely multi-glitter in a clear base. 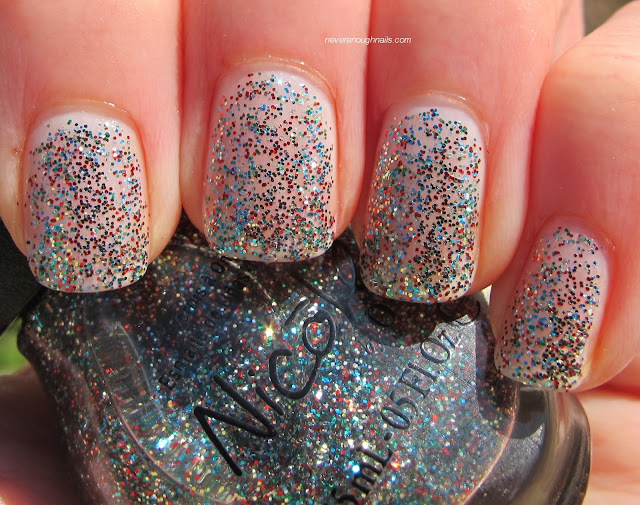 These glitters are small, but larger than the sugary glitter in All Is Glam. I see lots of red, gold, blue, silver and green glitters in Kardashing Through The Snow. (By the way, every time I read that name, I sing it *kardashing through the snoowwww*.) This polish would make a lovely topper over another polish, but it's easy enough to wear alone in three coats as well. This was three coats and it looked quite opaque in person, with no VNL. My camera always likes to make these kinds of glitters look sparse, but it really wasn't. I'd wear this alone or maybe over white/silver. It was pretty easy to apply, just not as effortless as All Is Glam. Stop the presses!!! I found a bar glitter polish that I don't hate!!!! To be honest, I didn't realize Nicole by OPI A Gold Winter's Night was a bar glitter until I went to swatch it for these pictures. When I realized it was gold and holo bar glitter in a clear base, I was a little sad because I thought I'd hate it. I also thought it would need to be layered over something, so I grabbed Here We Kome A-Karoling to put under it. HOWEVER, I actually like this!!! I think I like it because the base also has a ton of small gold glitter, so the bars do not show up as much. 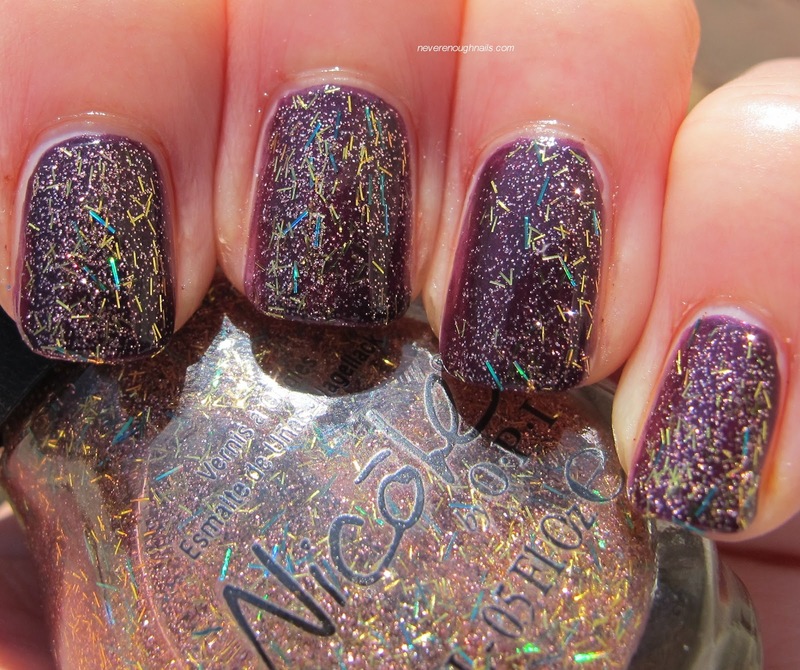 The base is also super packed with glitter, so you have to be really up close to even see that it has bar glitter. This is just one coat of A Gold Winter's Night over two coats of Here We Kome A-Karoling. You absolutely could wear A Gold Winter's Night alone in two, maybe three, coats. It is really packed with glitter. The blue-green holo bars pop really nicely against the gold too. I am surprised at myself, but I am keeping this polish and I am actually going to wear it this holiday season!! Overall, I really enjoyed swatching this holiday collection and I'm happy to be adding all six of these polishes to my permanent collection. The shimmers may seem like you've seen them before, but they have some unique qualities and great formulas too. The glitters are amazing. 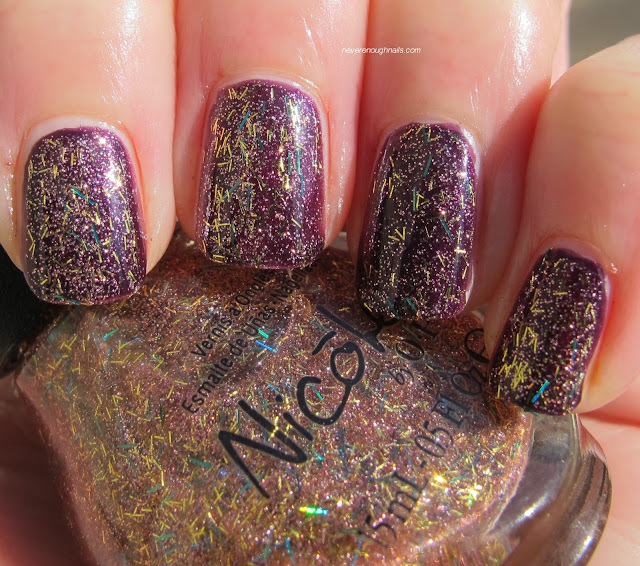 A Gold Winter's Night is a must for any bar glitter fans and All Is Glam, All Is Bright is a must for every human being who likes nail polish. Limited edition Kardashian Kolor Holiday shades are available now for $7.99 each in the U.S. at select Target, KMart, ULTA, CVS, Meijer, Sears, Kroger, H-E-B, Duane Reade, Fred Meyer, Giant Eagle, Harmon, and Winn-Dixie locations. In Canada, these lacquers will be retailed for $10.99 each in Shoppers Drug Mart, Loblaw, and Jean Coutu. All is Glam... is gorgeous!! Yea I'm kinda obsessed with it Marisa! If you decide you don't want to keep Kar-dashing Through the Snow... let me know! I freaking love it! Haha, if I suddenly lose my love of glitter and decide I don't like it, Kardashing is all yours Amanda!